Arani is a comfortable holiday home with stunning island views. The chalet is set on four acres of beautiful hillside, just a short walk away from a secluded beach. The unique two-storey A-frame chalet sleeps between two and four people, and is equipped with a kitchen to cook your own meals, and a large private deck to enjoy the sunset. This is the ideal holiday location for couples, families or groups searching for a peaceful private retreat on the Coromandel Peninsula, just a short drive away from the charming Coromandel Town. 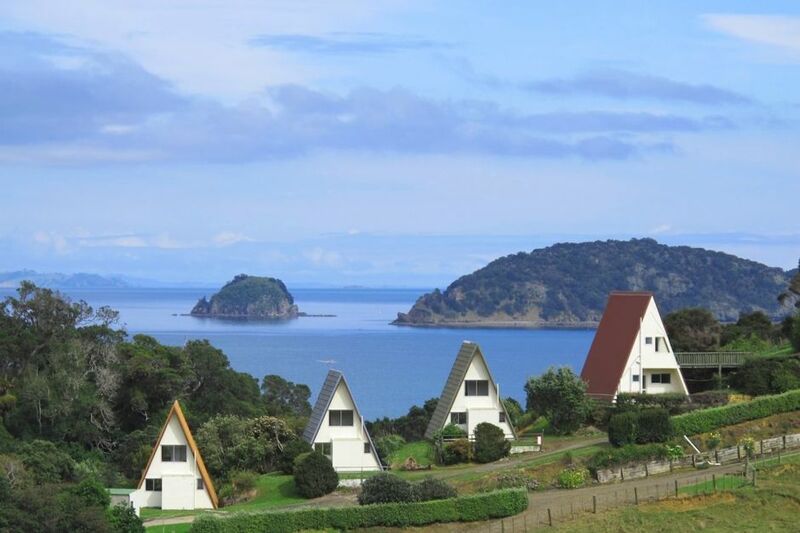 Enjoy activities such as fishing, kayaking, tramping and mountain biking, or just relax and enjoy the views across the bay. Cleaning and linen included. Use of kayaks and paddle boards included. Pick-up from Coromandel Town available upon request. Lovely rural setting minutes from a secluded beach. Had a wonderful anniversary stay, well appointed and clean (even though the reservation we made a month in advance on this platform only came through to the owner the day after we arrived!). We were able to bring our dog with us, which was great, although oitside the chalets is not fully fenced. This was okay for us as he is good and stays close but may be tricky for others. Located in a quiet spot, nice beach a 5min walk away - all in all a great stay, thank you! Good basic clean base for North Coromandel.